It is another Secret Recipe Club reveal day! This month, we were assigned the blog A Healthy Jalapeno. Laura, the author of A Healthy Jalapeno, loves cooking and is a self-described "health food junkie." She has adorable dogs and lots of yummy recipes available on her blog. With our latest attempts to focus on healthier eating, we were excited to explore Laura's blog... but then we found this perfect fall recipe and just had to try it out. It is exciting that Kelsey and I are actually doing this post together. She had a conference in Arlington and needed me to do the actual baking for the Secret Recipe Club. We decided that we would half the recipe as there are only three of us to eat the cookies. I was very excited about the Maple Walnut cookies as my favorite ice cream is Maple Walnut, so this combo is a favorite. The recipe was very easy and after I halved the recipe, I decided that a little more flour was needed to make the dough stiff enough to roll. We decided that we loved the flavor and that the cookies were not overly sweet. These will be really good with a nice cup of tea on a fall afternoon. Thank you, Laura! In a large bowl, cream the butter and brown sugar. Add the egg, syrup and vanilla. Mix until well blended. Sift together the flour, salt and baking soda. Stir into mixture, add walnuts and combine until well blended. Shape into 1 inch balls and roll in sugar. Place on cookie sheets about 2 inches apart and flatten slightly. Serve warm and possibly even with a glass of hot apple cider. Yum! Yummy! 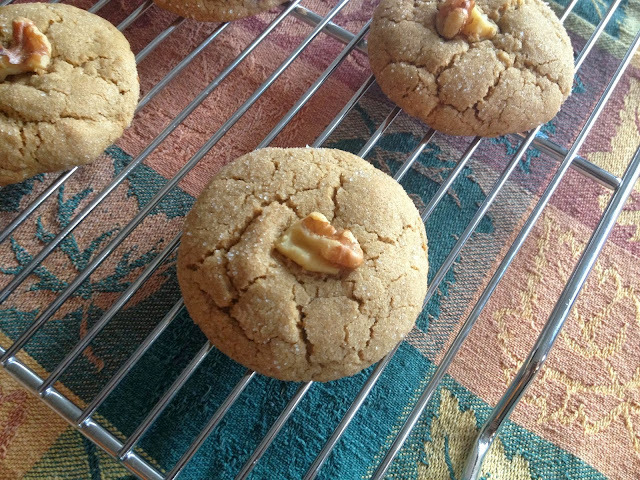 Maple and walnuts go so well together! These cookies look amazing - a prefect use for some of the maple syrup my sister gave me! Oh wow, I totally want one of these right now. 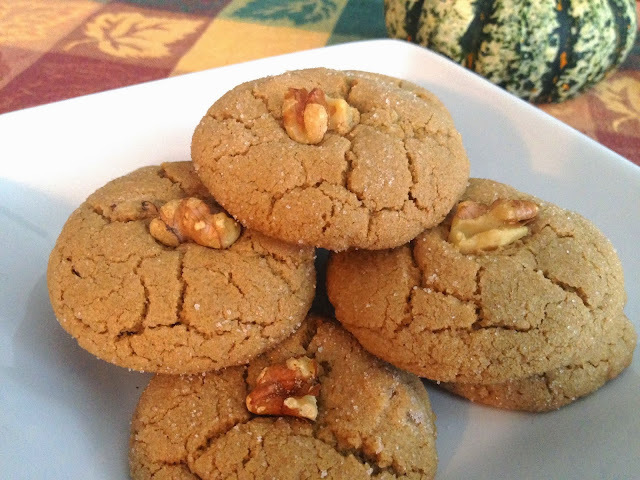 I can't eat walnuts, but maybe if I just do the cookies with pine nuts? I love maple anything, but have never had a maple cookie. GREAT pick! !